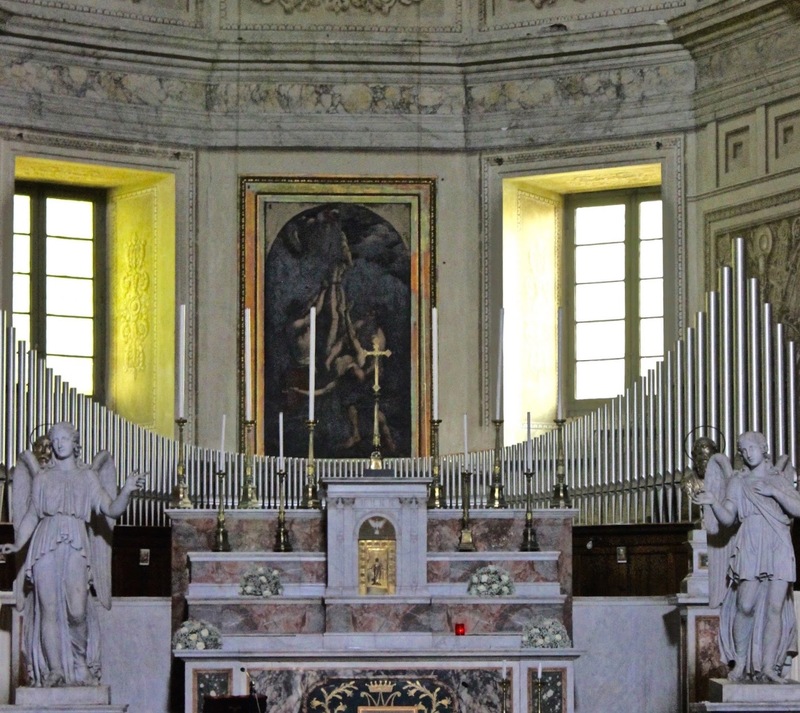 The Roman Anglican: San Pietro in Montorio and Sant'Onofrio al Gianicolo. 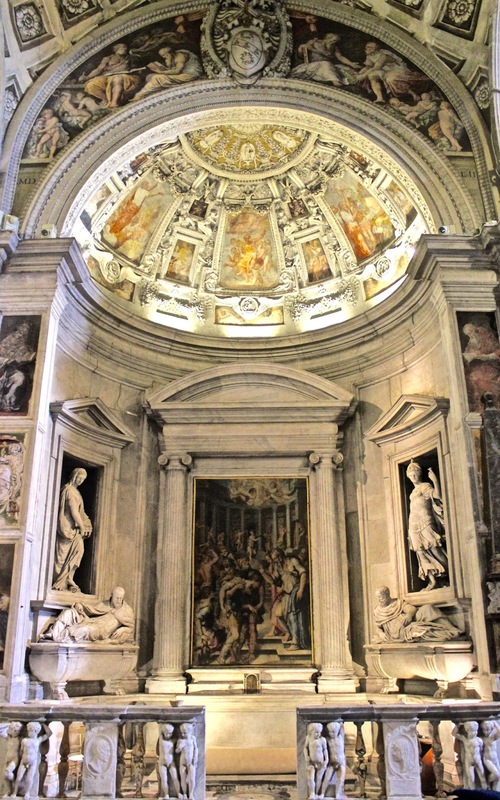 San Pietro in Montorio and Sant'Onofrio al Gianicolo. 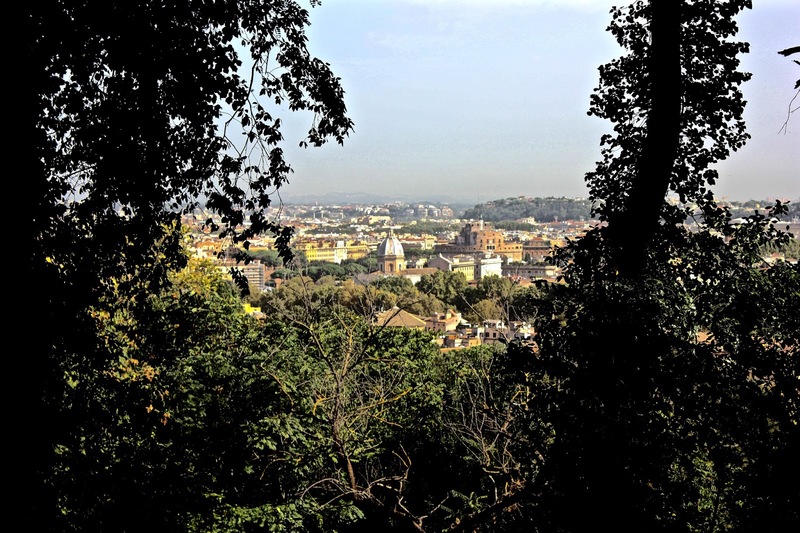 The beautiful Janiculum hill just south to the centre of Rome offers some breathtaking views on the Eternal City. 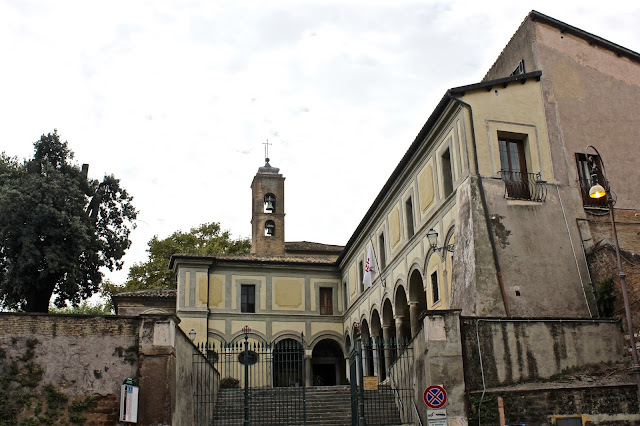 A simple stroll in this lovely place which also happens to be a lovely park can also get somewhat ‘historical’… the promenade is opened and closed by two important building, two churches: San Pietro in Montorio and Sant’Onofrio, both, remarkable Renaissance gems. 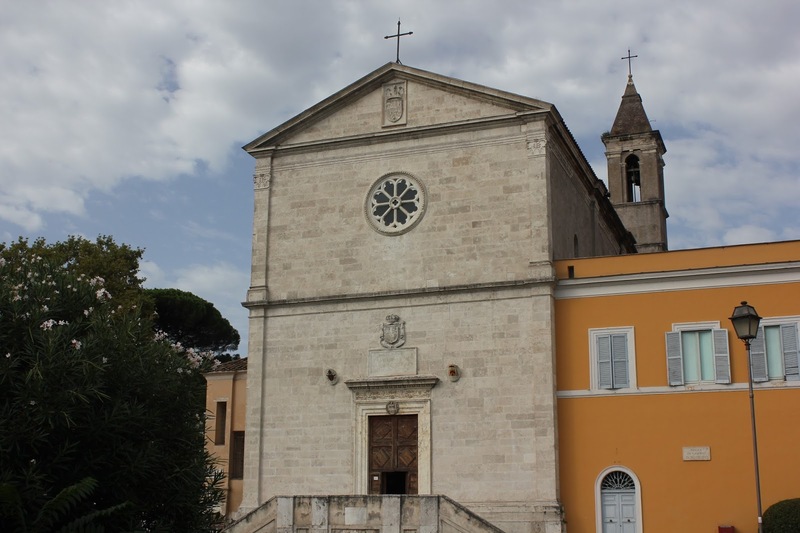 The first church; San Pietro in Montorio is located in a beautiful piazza with a great panorama on the city. 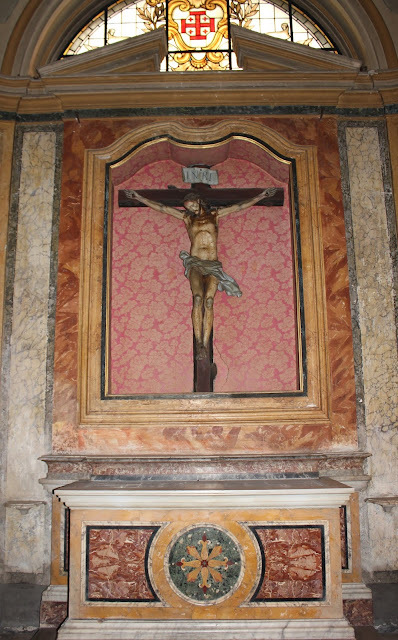 It was built on the site where St. Peter was crucified. 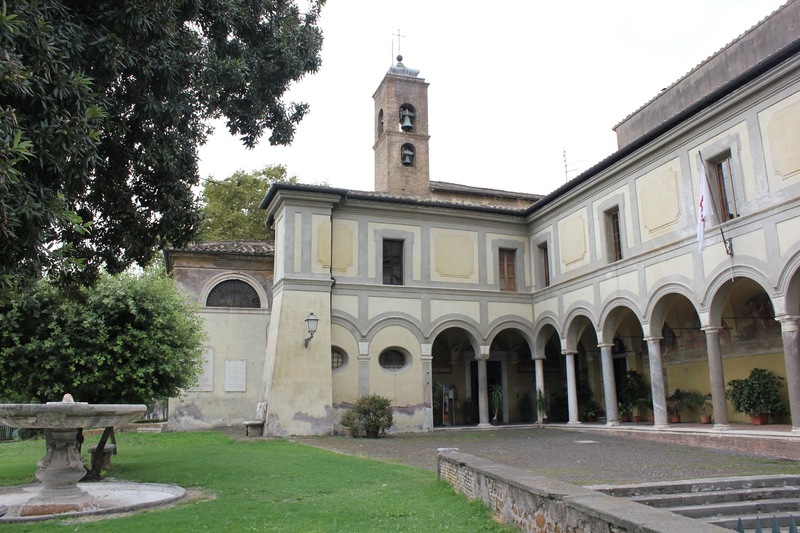 The first documents regard a monastery dedicated to beati Petri quod vocatur ad Ianiculum in the IX century. 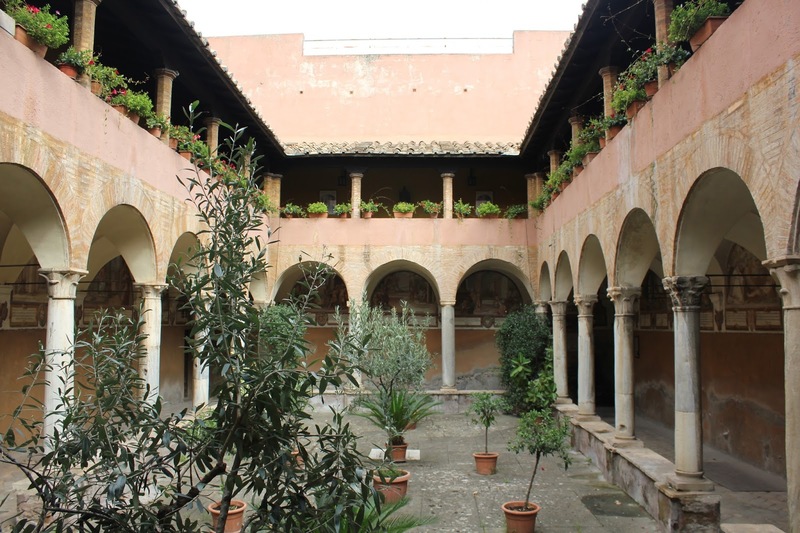 The monastery started as a Benedictine foundation. In c.1320 the church was dedicated to Sancti Petri Montis Aurei and given to the Celestine order, then to the Ambrosians and finally to Benedictine nuns. 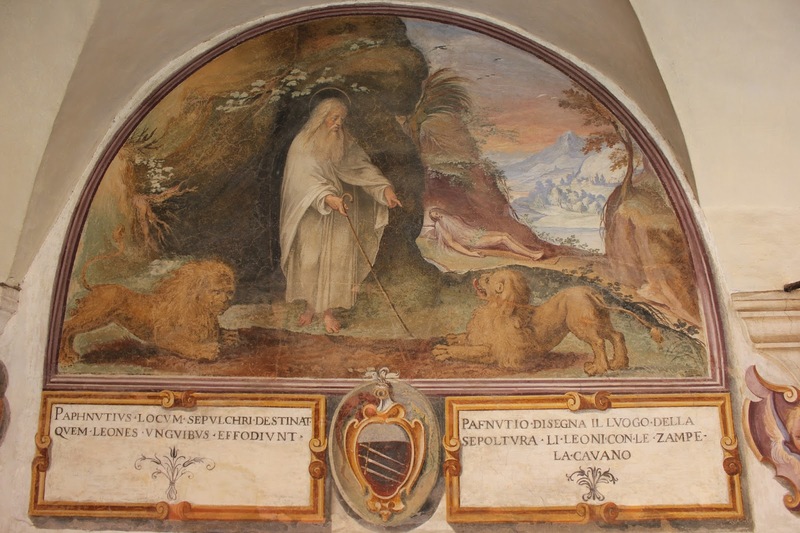 In 1472 pope Sixtus IV gave the church (which was in bad conditions) and some land nearby to the Franciscans who restored the convent and rebuilt the church. 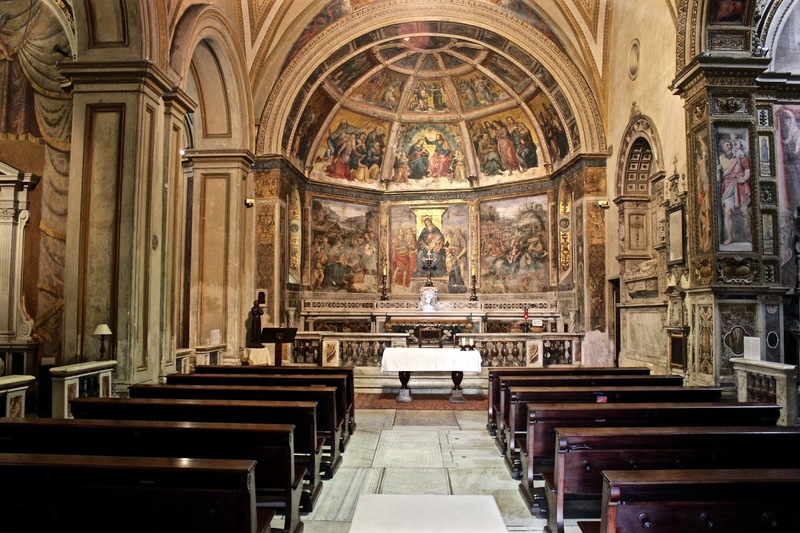 The reconstruction of the church was part of the new papal politics concerning the foundation of new buildings throughout the city. This cause received much economical help, especially that of Louis XI of France to Sixtus IV and then that of Ferdinando and Isabela of Castile to pope Alexander VI Borgia who consecrated the church in 1500. 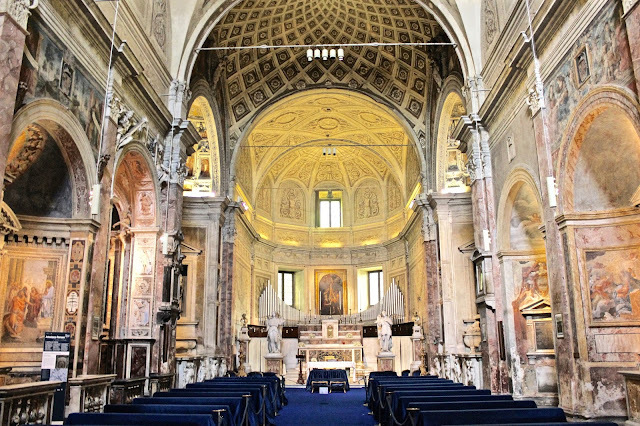 The design of the church is attributed to Baccio Pontelli or Meo del Caprino. The church was very close to the borders of the city and was therefore taken by the French during the late XVIII century. 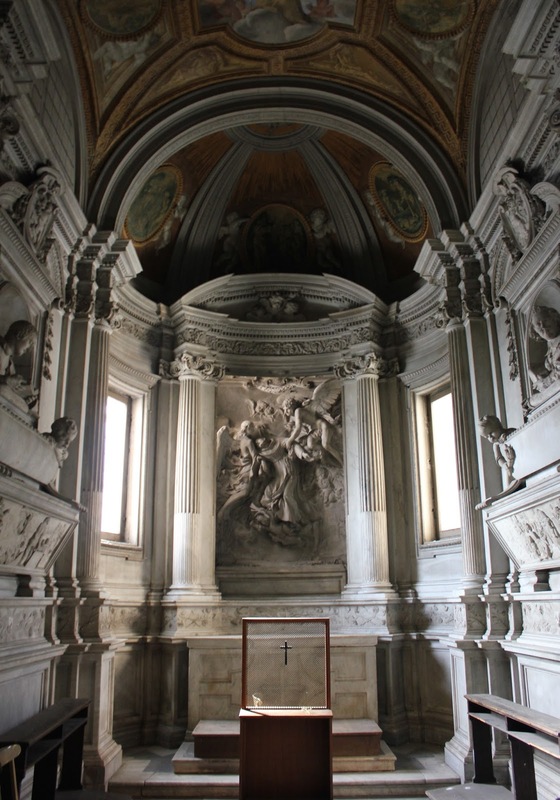 The French made an hospital out of it so the church received a nickname: San Pietro in Mortorio (St. Peter’s in the morgue). In 1876 the Kingdom of Italy donated the convent to the Academy of Spain which still owns it. The church is still in use. 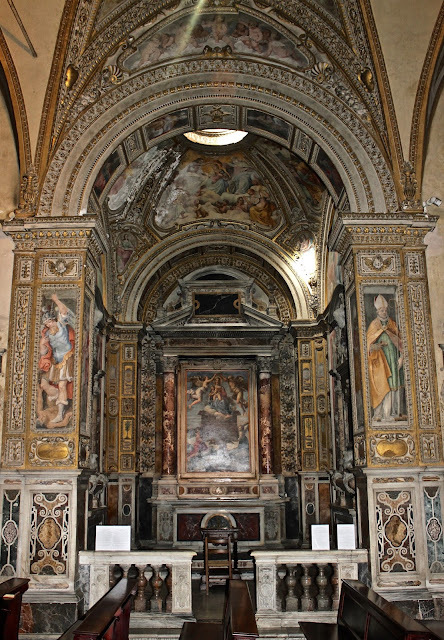 The church is decorated by some great Renaissance, Mannerist and Baroque artists. 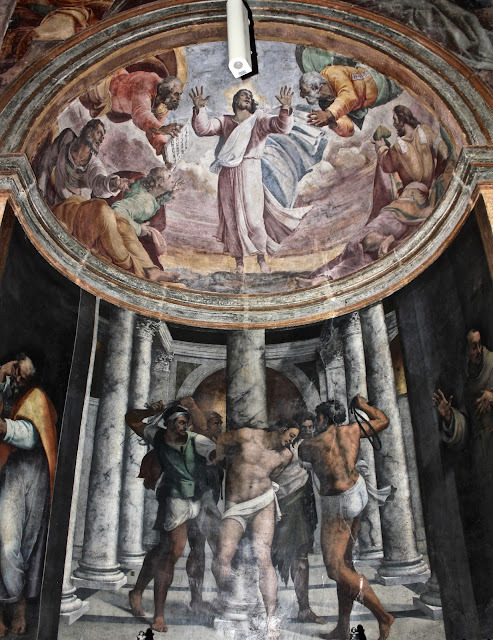 The first chapel on the right has frescoes by Sebastiano del Piombo representing the Flagellation and the Transfiguration, executed between 1516 and 1524. 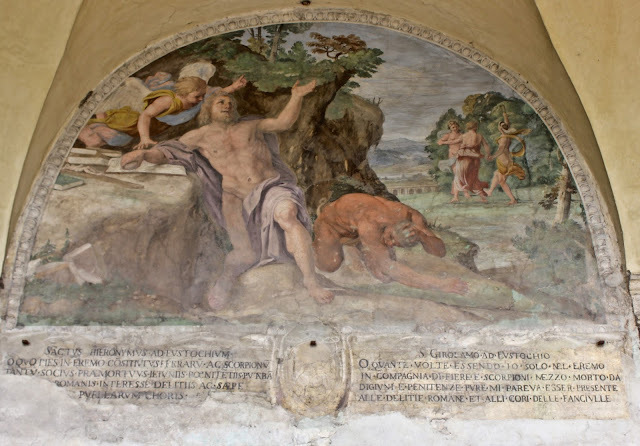 Michelangelo a friend of Sebastiano, also did some drawings for the Flagellation. 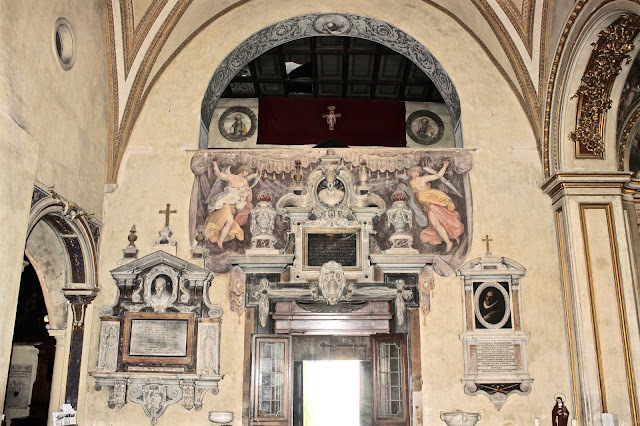 The second chapel on the right has frescoes by Baldassarre Peruzzi: a Coronation of the Virgin and the four Cardinal virtues, executed during the first decade of the XVI century. Above the following chapel there is another fresco by Baldassarre Peruzzi representing the sibyls. 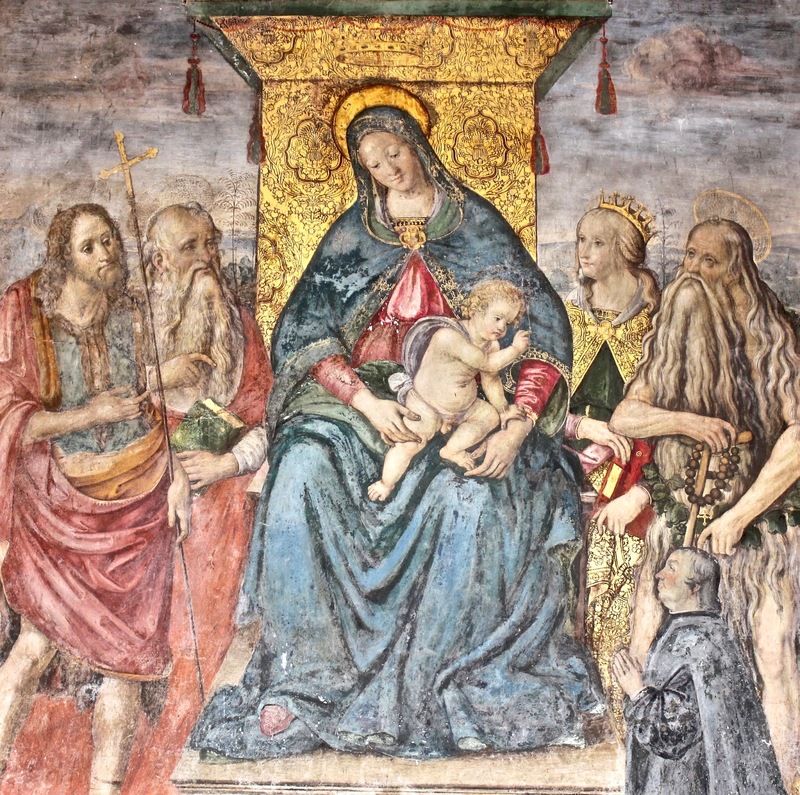 This was executed in the first decade of the XVI century too. 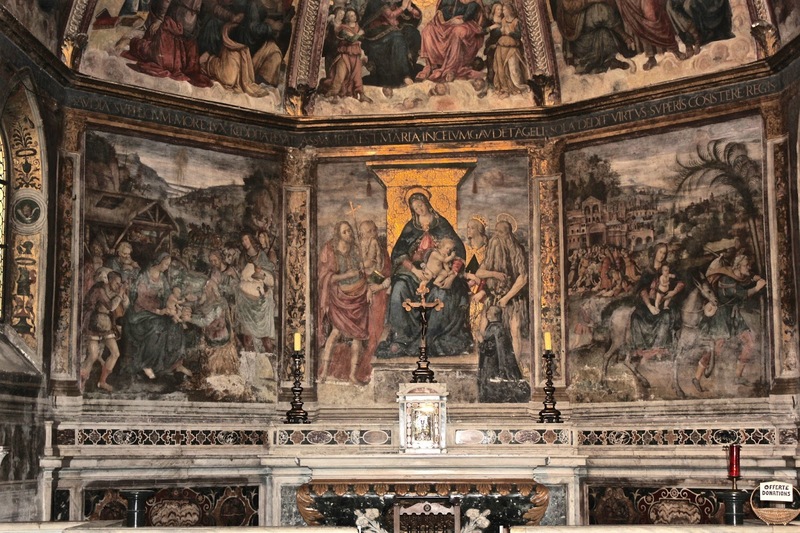 The fifth and last chapel on the right has a ceiling frescoes by Giorgio Vasari representing the Conversion of St. Paul, the altarpiece is also by him and it portrays the Baptism of St. Paul. Although there is no grave marker, tradition has it that Beatrice Cenci, executed in 1599 for the murder of her abusive father and made famous by Percy Bysshe Shelley, is buried in this chapel. Until 1797, Raphael’s final masterpiece, the Transfiguration was placed above the high altar, it is now in the Vatican pinacoteca. 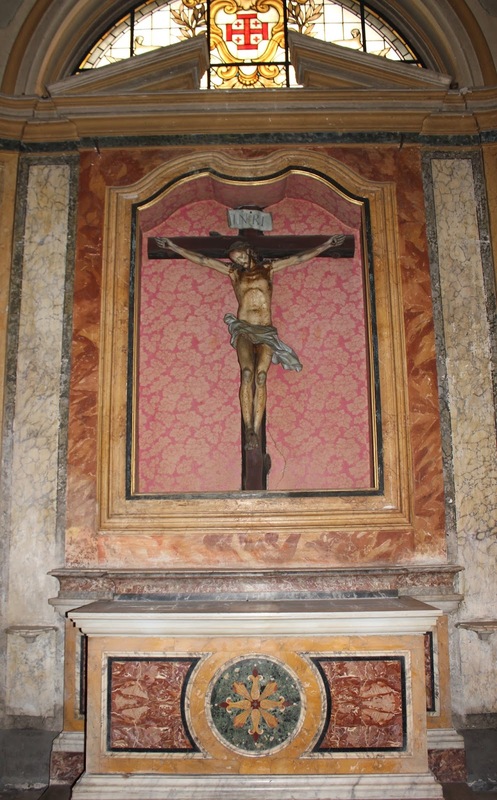 The altar now displays a contemporary copy of Guido Reni’s Crucifixion of St. Peter (which is also now in the Vatican pinacoteca). The last chapel on the left has a fine altarpiece representing the Baptism of Christ, attributed to Daniele da Volterra. The following chapel, known as the Pietà chapel, has a fine altarpiece, representing the Entombement, by Dirck van Baburen, a central element of the Dutch Caravaggisti. 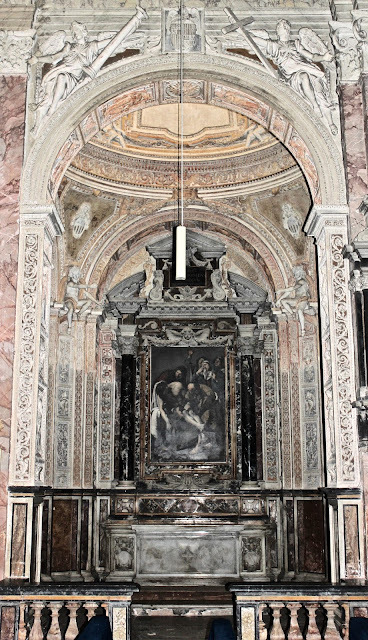 Other works in the chapel are by him or by the other Dutch Caravaggista, David de Haen. 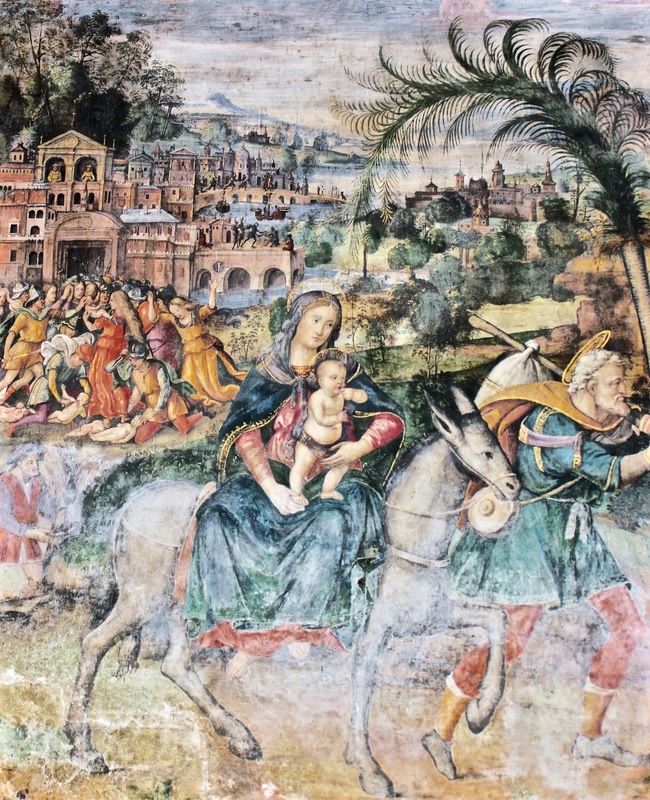 The third chapel on the left has frescoes by Antoniazzo Romano. The altarpiece represents Saint Anne, the Virgin, and Child. 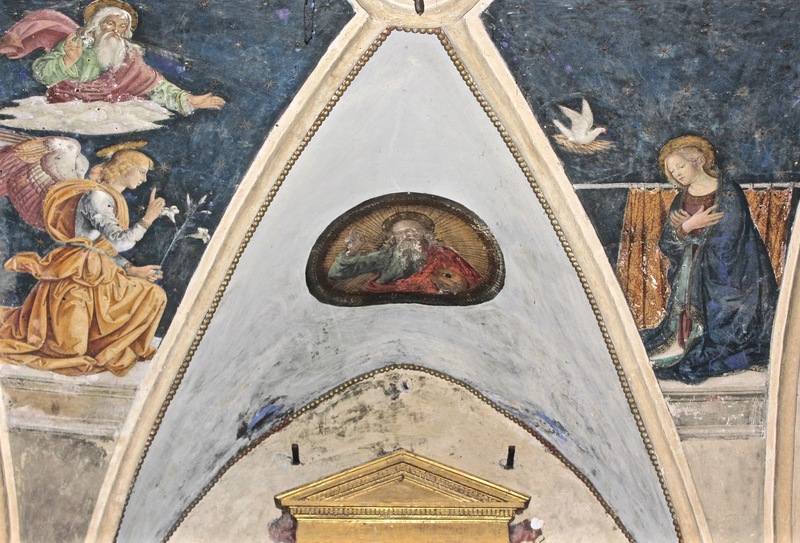 The ceiling has a mandorla with God the Father and the fresco above the chapel represents Salomon and David. 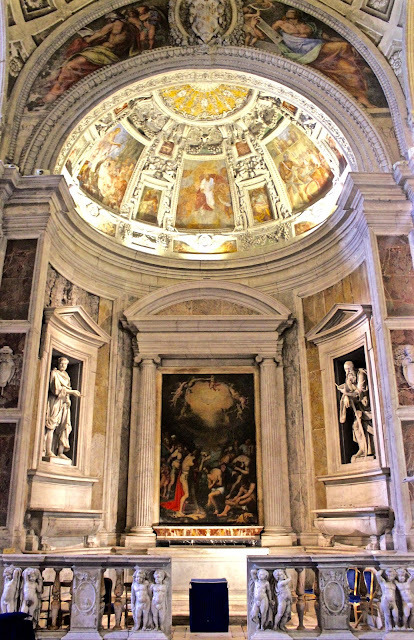 The second chapel on the left, the Raimondi Chapel (1640) was designed by Gian Lorenzo Bernini. 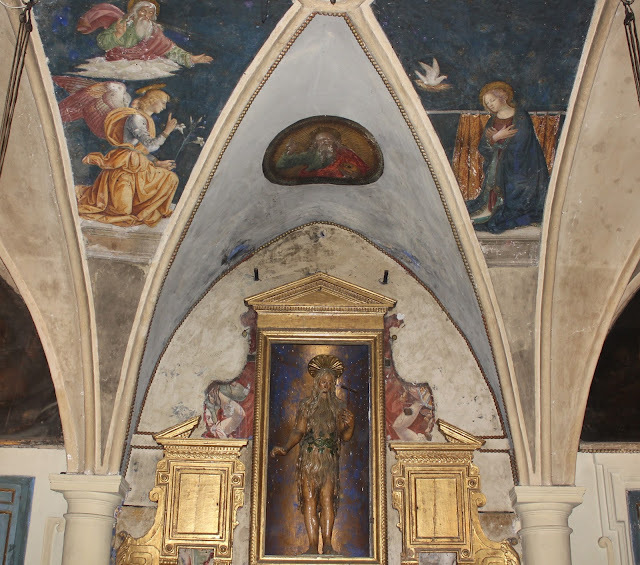 It also includes frescoes by Francesco Baratta and sculptures by Andrea Bolgi and Niccolò Sale. The Tempietto (“small temple”) is a memorial built by Donato Bramante, in 1502, in the couryard of San Pietro in Montorio. 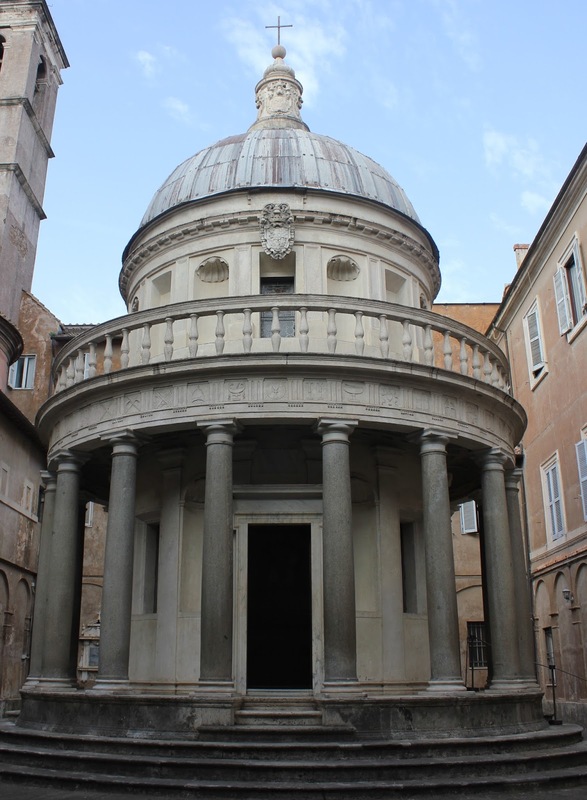 This work was also commissioned by Ferdinando and Isabela, the Tempietto is considered one of the great masterpieces of the High Renaissance Italian architecture. After spending years in Milan, the artist moved to Rome where he was notices by Cardinal Giuliano della Rovere (future Pope Julius II). 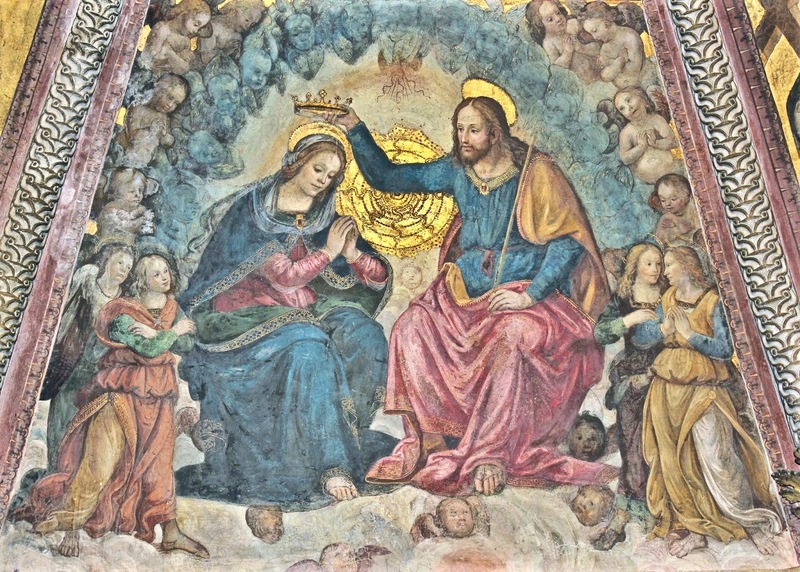 He was able to study ancient Roman architecture which inspired his work greatly, he was also inspired by Brunelleschi. Many of the temples he studied were circular and so is this too. 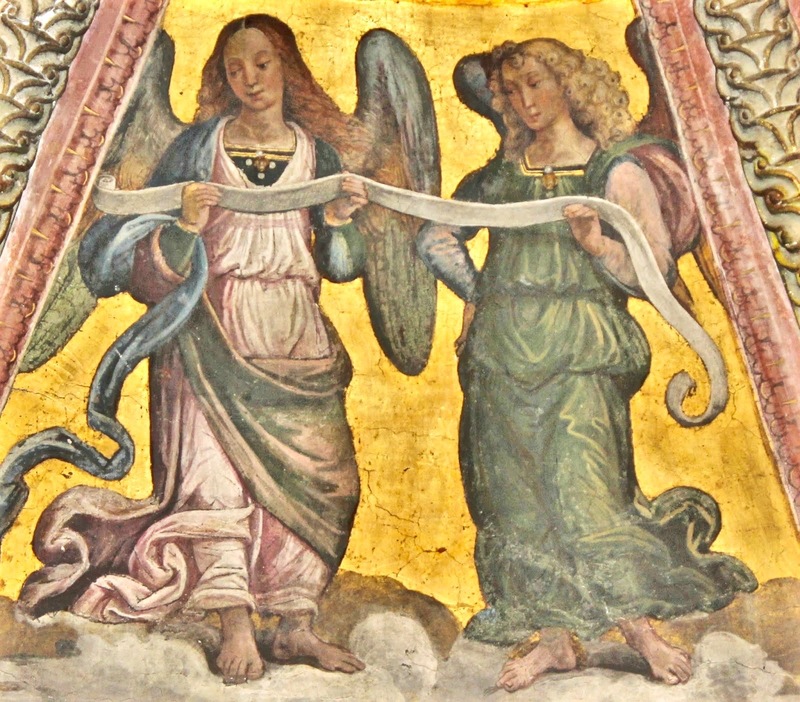 The tempted is the first work in the Renaissance to have Tuscan columns. 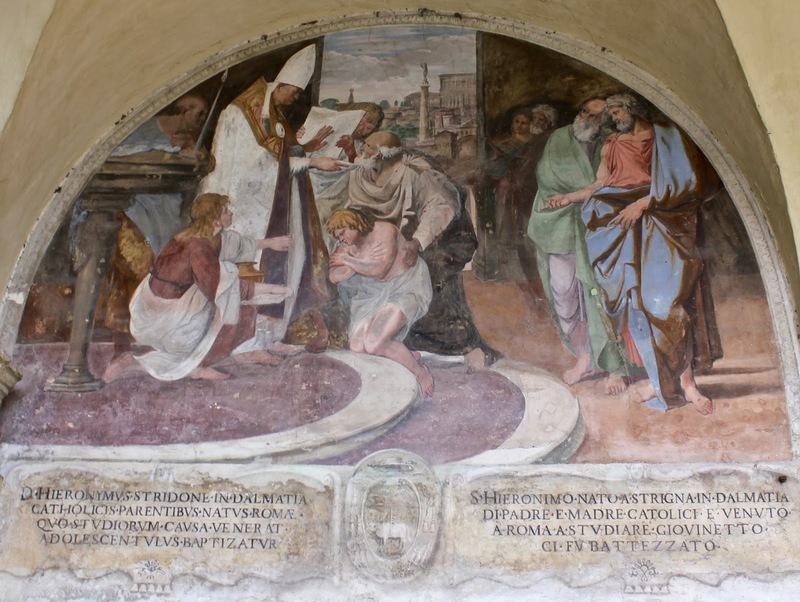 The tempietto signs the exact spot of the martyrdom of St. Peter. The little temple is perfectly proportioned. Inside there is an altar with carvings representing the death of the saint. The floor is in the late Ccsmatesque style. The second church is Sant’Onofrio, which is located on a small terrace with a garden and also in this case, a great view on Rome. 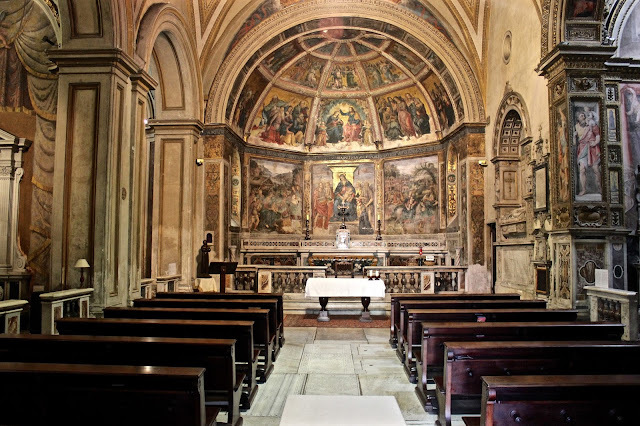 The construction of the church began in 1439 after pope Eugene IV approved its foundation and was completed in 1446 at the end of a steep climb known as Salita di Sant’Onofrio, made in order to facilitate the access to the Janiculum Hill from the Vatican. The church has only a single nave with two chapels on each side. It houses several works of art by great artists of both the Renaissance and the XVII century. The church does not have an actual facade but it has a lovely “L” shaped portico. At the end of the portico there is little chapel known as the Madonna del Rosario built in the early 600s for the Vaini family from Florence. The little cloister is probably the oldest feature of the church. It dates back to the mid-XV century and it has frescoes with stories of the life of Sant’Onofrio by the Cavalier d’Arpino, made for the jubilee of 1600. 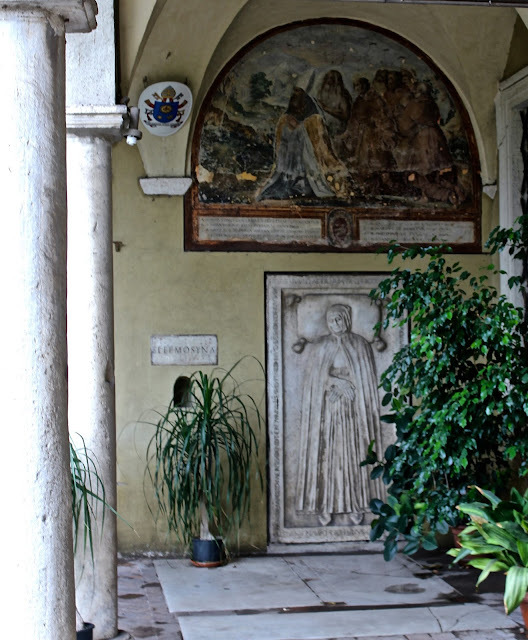 The little passage that leads from the portico to the cloister has very damaged Renaissance frescoes representing monks. 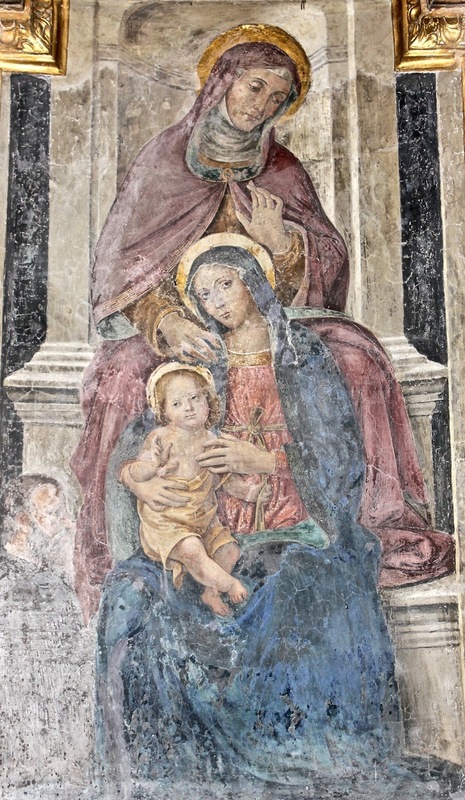 One of the frescoes by Cavalier d'Arpino in the Cloister. 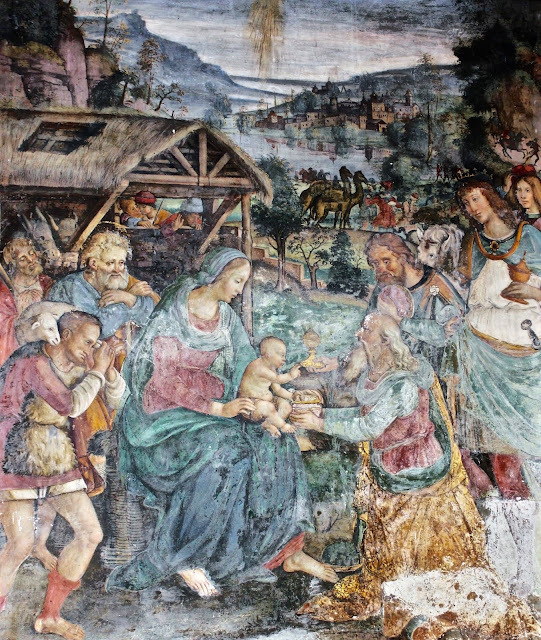 A detail of the early XV century fresco between the portico and the cloister, Tuscan school. One of the frescoes by Domenichino in the portico. The church is famous for its links with Torquato Tasso, the great Renaissance poet who wrote Jerusalem Delivered in which Christians fight Muslims and take the Holy Land back. He spent the last years of his life here, hoping to be crowned poet by pope Clement VIII, like Petrarch but centuries before. 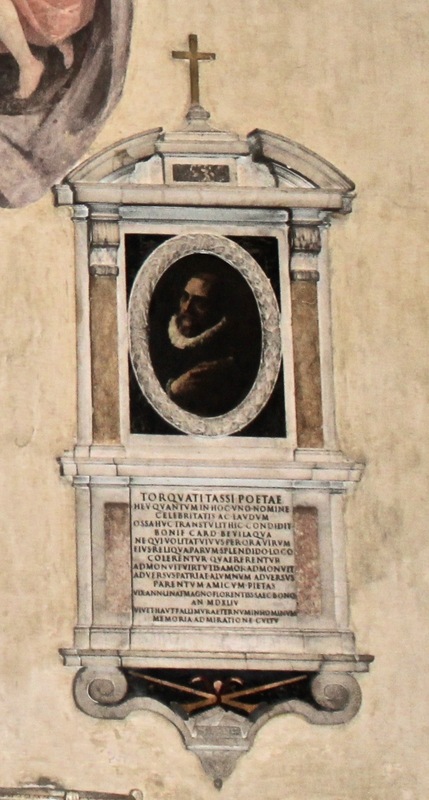 The “coronation” did not take place because the poet died on 25 April 1595. 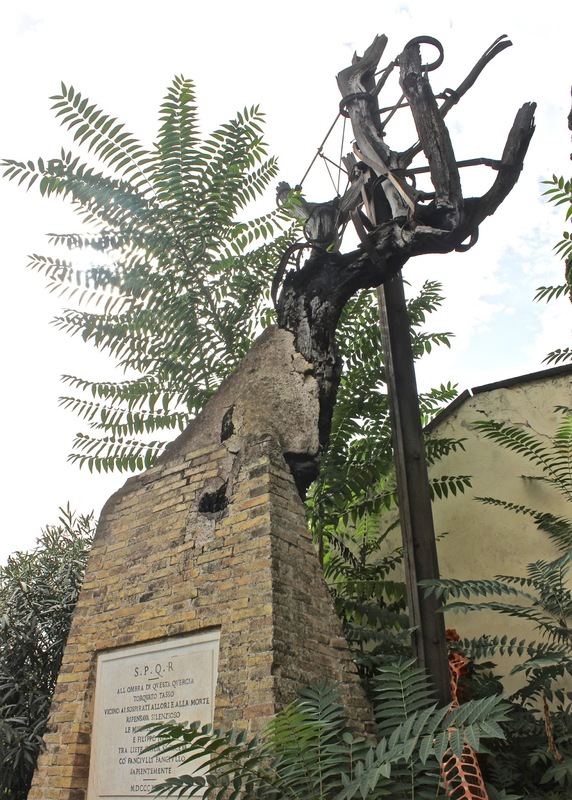 Sant’Onofrio became then a shrine to artists and poets visiting Rome. Not far from the church there is also what remains of the dead oak tree under which the poet used to meditate. The same place was later used by St. Philip Neri for prayer and as a place to gather with his congregation. In 1945 pope Pius XII gave part of the convent to the Equestrian Order of the Sacred Sepulchre of Jerusalem, in honour of Tasso’s masterpiece. In the XVIII century Goethe visits Sant’Onofrio and writes an impression of it in his Journey to Italy. 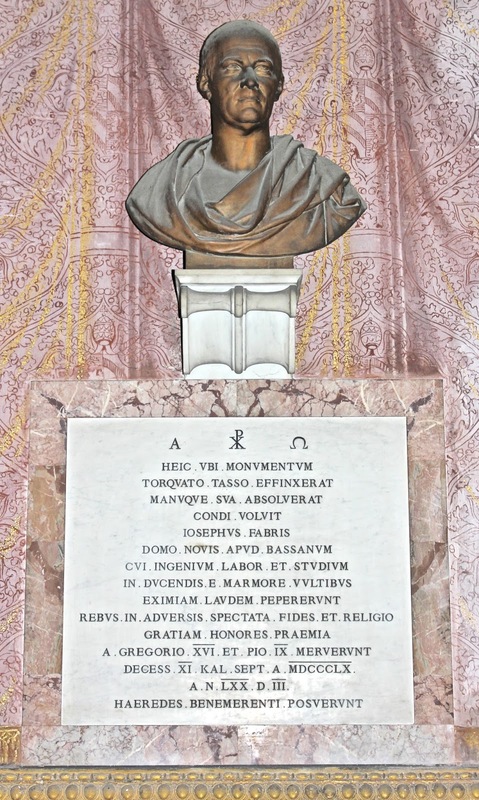 Tasso's memorials in the Church. 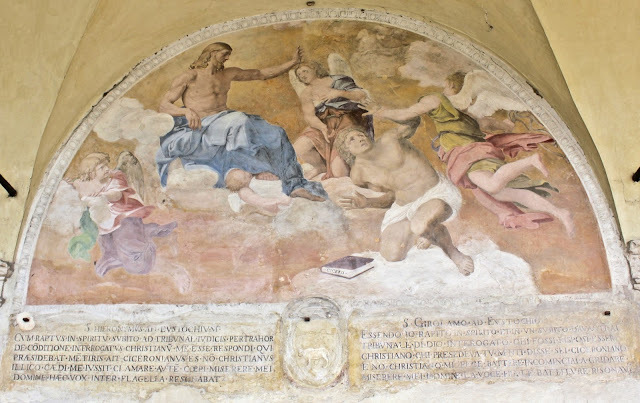 The loggia has three lunettes with frescoes by Domenichino representing the life of St. Jerome, executed during the early XVII century and a tomb by the school of Donatello. The counter-facade has a Mannerist fresco representing two sibyls holding drapes by Giovanni Baglione, late XVI century. The first chapel on the right houses a fine Annunciation by Antoniazzo Romano executed at the end of the XV century, it is regarded as one of the finest frescoes by the artist. 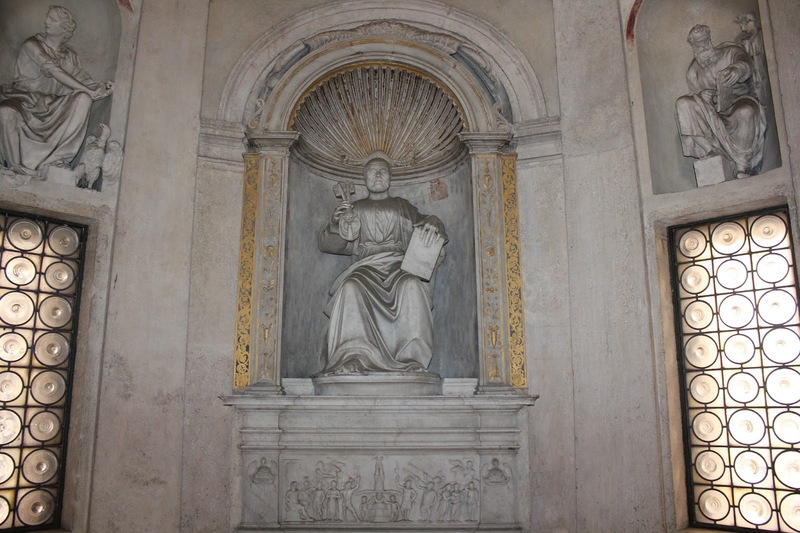 The chapel also has an original Renaissance statue of Sant’Onofrio on the altar. 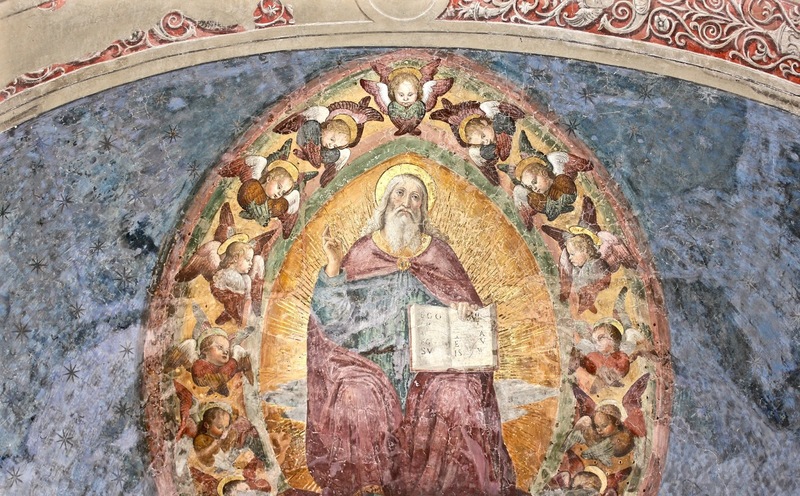 Above it there is a representation of God the Father by Peruzzi. The second chapel is a little early Baroque masterpiece, the altarpiece is a Madonna di Loreto by Annibale Carracci, it has frescoes with stories of the life of the Virgin by Giovan Battista Ricci. 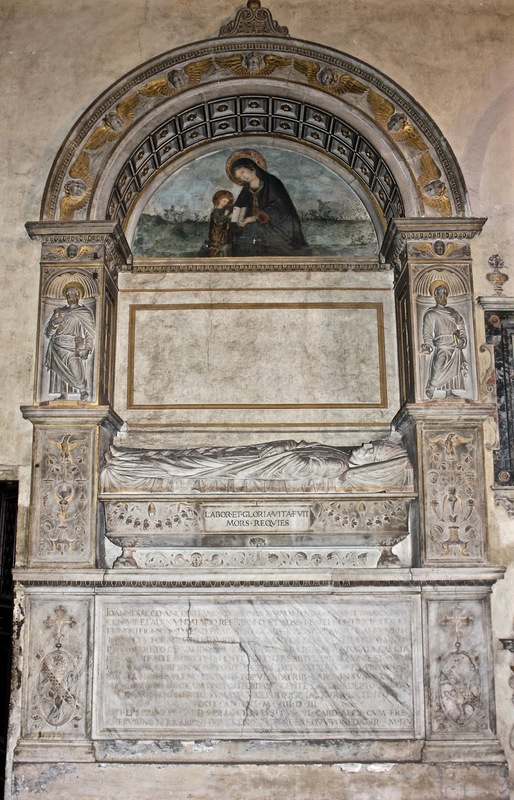 Next to the sacristy’s door there is a monument by the school of Bregno with a fresco of St. Anne’s teaching Mary to read, attributed to Antoniazzo Romano. 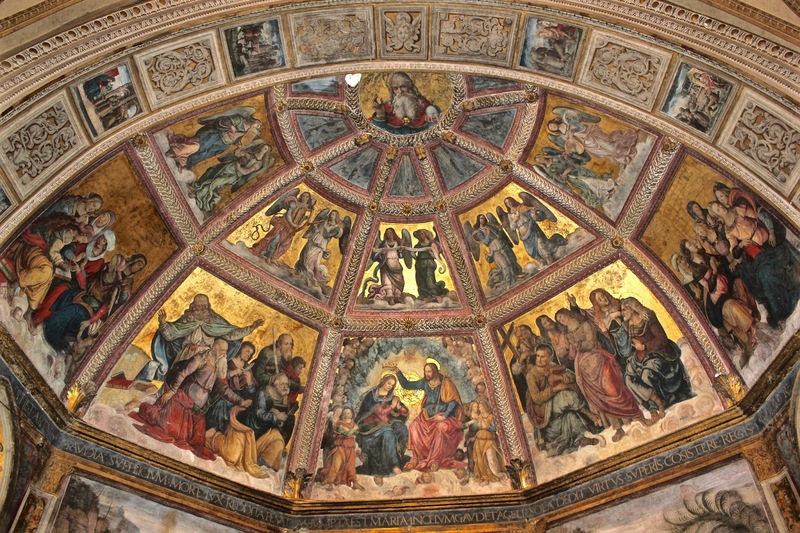 The apse, was painted in the late XV century by Bernardino Pintoricchio with the Coronation of the Virgin, saints and angels in the upper part and by Baldassarre Peruzzi in the lower part with Madonna and Child with Saints, Adoration of the Magi and the Flight from Egypt. The Crucifix chapel houses a nice Baroque one. The first chapel on the left houses two memorials of Tasso. A third one, his tomb is in the counter facade.